An automated multi-industry lending platform that provides a competitive marketplace for borrowers & lenders to transact based on their preferences. Zuma emerged to address the large & underserved lending market which is limited by high costs and lack of automation. Zuma’s automation enabled lending platform allows institutions to tap new markets, offering lenders the ability to focus on a particular sector. The lending marketplace will allow institutional investors to register & utilize auto-invest algorithms to match their institution’s risk & sector preferences, allowing for portfolio diversification. The marketplace will consist of 5 borrowing sectors – Business (including ZLS), Mortgages, Personal, Government-sponsored & Auto. 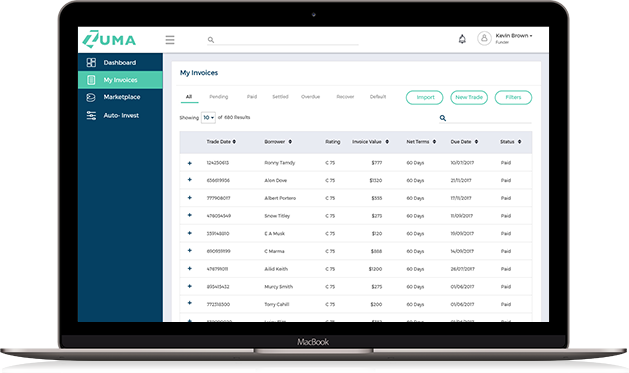 Zuma debuted on May 8th of this year with a live demonstration at FinovateSpring 2018. The live demo illustrated how Zuma Liquidity Solutions can enable businesses to monetize their accounts receivable for a discount and resolve typical working capital issues, so that they can focus on their core daily business operations. For Liquidity Institutions, ZLS serves as a platform to make invoice financing a more cost-efficient, transparent and frictionless process. FinovateSpring, hosted by The Finovate Group, showcases cutting-edge banking and financial technology from both startups and established companies. The conference draws an audience of more than 1600+ C-level financial and banking executives, venture capitalists, press industry analysts, and entrepreneurs from across the Fintech spectrum. Zuma emerged to address the large & under served lending market which is limited by high costs and lack of automation. Zuma’s automation enabled lending platform allows institutions to tap new markets, offering lenders the ability to focus on a particular sector. As a white-label product, Zuma is in discussion with banks and alternate liquidity providers that have expressed interest in the platform. Increase your cash flow for your business using Liquidity Solutions. Zuma’s proprietary credit decisioning system improves your score as you obtain more financing. As a lending institution, Zuma’s white label offering allows you to enter an underserved market that was lacking transparency. Zuma’s real time information system provides the borrower and lending institution a more transparent approach to invoice financing. Connect your accounting system to Zuma Liquidity Solutions and start increasing cash flow in minutes. As a lending institution review and approve borrowers and invoices using the Zuma Host account. Utilise the ZLS Auto Invest solution; investors can set specific investment preferences and Zuma will go out and make those investments for you. Making mortgages easy; using automation to reduce your lending costs. Upload your financial records, connect your bank account and we can match you with a lender in no time at all. View and filter mortgage offers based on your preferences; you shop online for everything else, why not your mortgage? As an investor Zuma allows you to enter new markets and diversify your investments. Private connection to your bank account allows Zuma to perform in-house finance checks, without affecting your credit score. Zuma Mortgage search allows you to create specific preferences based on your mortgage needs. The investor dashboard provides analytics and insights into the types of mortgages invested in. Our automation systems connect you to lenders for the best rates on personal loans. Search for loans that meet your lending requirements. Diversify your portfolio- invest in loans to increase returns, use Auto Invest to manage your investment funds smarter. Borrowing and investing with Zuma is smarter and more transparent for both parties. Access your Zuma Personal account via our online portal, manage your loans anywhere, anytime. Create specific search preferences and find personal loan rates on Zuma that you would never find on the high-street. Using the Zuma Host account; lending institutions can leverage their existing customer base by automating your targeted email campaigns. Unlock cash from your government sponsored loans whether you’re a student, first time home buyer or small business. Convert your long term government sponsored loan into a short term financing option. Obtain financing from your government loan to invest and expand your business. Investors have a new opportunity to obtain returns by investing in a low risk government backed loan. Zuma’s proprietary credit scoring system allows your business to join the Zuma platform in seconds and does not run any personal credit checks. Once approved onto the platform upload the loan you wish to get financing for; the Zuma Host and Investor will review your supporting documents and wire the funds in hours, not days or weeks. The Zuma platform allows lending institutions to finance loans based on their risk preferences, allowing for a balanced portfolio. Bad credit history? Zuma can give you wheels; we match you to the best lenders for auto financing. A competitive marketplace to find car loans, Zuma connects you to lenders with great rates. Search and compare a number of loan options based on your auto needs. Lending institutions are able to enter into a new market, using the Zuma White Label solution there will be no implementation costs, through the use of non-evasive technology. Get financing for your new car in no time. Connect your bank account and let Zuma do the hard work, we will match you with a lender in minutes. Enter your specific auto loan requirements, Zuma will go out to the market and find the best lender for you. Zuma White Label is a cloud based application and allows you to enter new lending markets with a lower cost. Copyright © 2019 Zuma Technologies LLC. All Rights Reserved.